I love working with my patients. I spend 2 hours the initial visit including a comprehensive history, exam and treatment. Subsequent sessions are 1 1/2 hours. 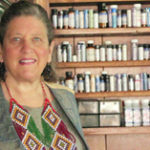 I am a California State licensed Acupuncture Physician and a nationally certified Acupuncturist and Herbalist since 1990. 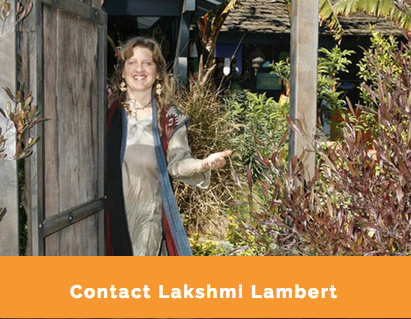 My background is as an Herbalist, Psychotherapist, Yoga Teacher and Deep Tissue Massage Therapist. I have been on the faculty at Ryoho Institute and Emperor’s College of Traditional Oriental Medicine. In my practice I combine all of my skills, education, intuition and experience. I create a personalized formula from my extensive pharmacy for each patient. The content of the formula aims at treating mind, body and spirit of each individual. The formula is changed as you change. 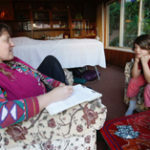 My practice of compassionate listening supports openness toward healing. Master herbalist, licensed acupuncturist, homeopath, massage therapist offering respectful, individualized health care for all ages. 30 plus years experience. My practice accepts insurance for acupuncture patients. In order to best serve you I can verify your insurance benefits before you arrive. Please click on the link below and complete the online form on the Holistic Billing Services website. I will contact you as soon as the benefits are established. Traditional Acupuncture originated in China around 5,000 years ago. The science and art of this ancient medicinal practice can be used to support both the creation and maintenance of health. 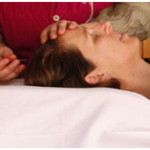 Treatment is focused on supporting a balanced and harmonious flow of energy throughout the body. In order to remove energy blockages, fine stainless steel needles are placed on specific meridian points throughout the body. Alternatively, if a patient is a young child or prefers not to have needles, Acupressure can be applied in the same areas of the body. Both Acupuncture and Acupressure are used as a holistic form of healing the mind, body and spirit. The use of cupping is used in dozens of traditional cultures to quickly and effectively clear heat and toxins from the lungs. In traditional Chinese medicine, the first cups were using cattle horns or cross sections of bamboo. Cupping relives muscle tension, promotes blood and lymph circulation. We use traditional Chinese medicine, tongue and pulse diagnosis to determine the acupressure treatment for the patient. I use my hands instead of needles. I have taught Acupressure for years and find treatment effective without needles for children or those that prefer not to have needles. I will also combine a needle/acupressure treatment for those with needle sensitive areas. Sitting straight in a grounded clear minded posture, Acupressure used the focus through the finger, usually the first or second digit. We hold a point with the left and right hands respectively, listening through our figures for harmony between the points. The ear coning process originates in the ancient civilizations of Tibet, China, Egypt, Aztec, Mayan and Indigenous cultures. The cone is made of linin dipped in medicinal herbs and beeswax. The narrow end of the cone is placed near the opening of the ear and the far end is burned. I massage the muscles and the scalenes with my free hand while coning. Coning stimulates the lymphatic system, pulls out impacted wax, and assists in the the function of fungus and candida. I'm certified as a body/mind integrator, postural integrator and acupressurist. 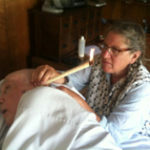 When called for I use structural integration bodywork or acupressure techniques in order to release fascial holding and to realign the body. Compassionate Communication is an approach to nonviolent living developed by Marshall Rosenburg in the 1960's. It is based on the notion that all human beings have the capacity for compassion and the ability to express their needs verbally. After a focused thought provoking questionnaire, the first hour of the initial session is spent in an in depth history, the patient expresses thoughts and feelings regarding their past, their fears, and desires for the future. A safe place for expression and respectful listening is maintained. Subsequent sessions, offer the first half hour of the hour and a half session for Compassionate Communication. as a form of alternative medicine. 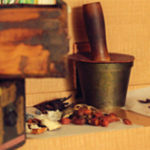 As an herbalist, trained in both Western Herbalism and Traditional Chinese Medicine, I utilize my pharmacy of over 300 herbs to create a personalized formula for each patient. The content of the formula aims at treating mind, body and spirit of each individual. The formula is changed as you change. Dance movement therapy and art therapy are used to establish and renew patterns for creative expression. Creative expression enhances the liver, the eyes and the will to become ones fullest self. Dance movement therapy improves mobility, balance, concentration, endurance, strength and flexibility. Movement for self expression penetrates to the core of truth and integrates body and mind. 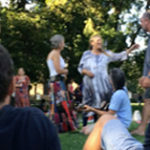 I hold a circle Wednesdays 7:30 - 9 pm. Personal expression and shared leadership during the warm up increase empowerment. Seeking understanding of healing Samuel Hahnemann created Homeopathy in the mid 18th century. He found that using a potentized minimum dose of an element prompted profound healing. Homeopathy was the main form of medicine practiced in the first half of the Twentieth century in the USA. In deep listening to the patient, a Homeopath with experience can find a constitutional remedy to bring the patient back to their healthy self. The remedy awakens ones vital force. First aid remedies are also given to match disease imbalances. Some say Tarot began as a game and was later interrupted for meaning. Others say Atlantean mores were encoded into the cards before the destruction of Atlantis. 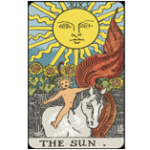 According to Dr. Joseph Michael Levry, "the Tarot is a system of complex symbology that comes from the Rota, which signifies the Wheel of the Torah - the esoteric Hebrew name for the law." Historically Tarot first appeared in mid 15th century Italy. Playing cards were first mentioned in European history in the late 14th century. In the mid 19th century Eliphas Levi connected the Tarot to the body of Jewish mysticism known as the Kabbalah. Artist have created hundreds of original decks, I used as least six. I use the card layout as a spring board for reveling truths about the seeker, which of course they already deeply know and are mirrored emphatically back to them. Moxibustion is an essential part of traditional Chinese medicine. Combining heat with the application of Artemesia Vulgaris, commonly known as Mugwort. In it's over 3,000 year history Moxa has traveled to different cultures and been adopted and forbidden by numerous dynasties. Moxa penetrates deep to warm cold stagnation and smooth the flow of Qi and blood. Moxa is helpful to relieve joint pain, menstrual cramps, in place of needles for immune deficient patients, reduce or remove warts, to turn around an inverted fetus, and increase energy.